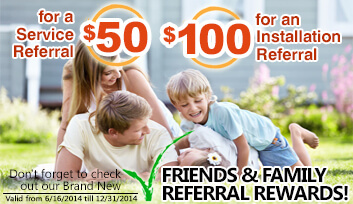 We guarantee your scheduled appointment or WE PAY YOU! Lawn sprinkler system startups, also called Irrigation turn ons are performed throughout the spring season. Summarizing or opening an irrigation system requires a lot more than just “turning the valve and setting the clock”. Properly setting up a lawn sprinkler system for the season is a detailed procedure that should only be performed by a certified irrigation technician - Your lawn and flowers will thank you! BRANDED “Bright Yellow” TRUCKS AND UNIFORM SERVICE TECHNICIANS. 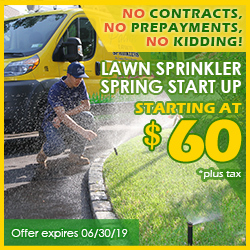 Pacific Lawn Sprinklers has installed and serviced many automatic lawn sprinkler systems in the Manhasset area and is well versed in working with the requirements of the Manhasset Lakeville Water Department. Specific permits and requirements are followed on each installation and the required backflow preventers and rain sensors are installed. 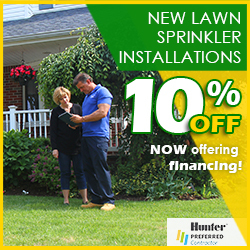 Knowing the area and the town requirements makes Pacific Lawn Sprinklers your local lawn sprinkler installer. Over the years Pacific Lawn Sprinklers has also installed many commercial irrigation systems and landscape lighting systems. Some of the well know ones are: St Mary’s School and Church on Northern Boulevard, The StoneHill HOA on Shelter Rock Road, The North Hempstead Town Hall on Plandome Road, The Greentree Estate on Community Drive, The Americana Shopping Center on Northern Boulevard, Plandome Park on Lake Road, Munsey Park Shopping Center on Northern Boulevard, Gracewood Homeowners Association on Shelter Rock Road, Our Lady of Grace Church and The Unitarian Congregation. Since 1980 Pacific Lawn Sprinklers has been providing quality drip irrigation system installations and service to LED landscape lighting systems in your area. Pacific Lawn Sprinklers business model of Independently Owner Operated branches allows us to provide you with neighborhood irrigation service with immediate response by your local ‘Sprinkler Guy’. 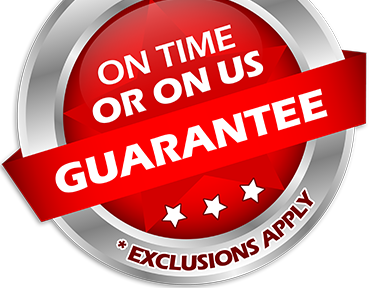 Pacific Lawn Sprinklers aims for 100% customer satisfaction, which means we will go the extra mile for our clients when providing irrigation service or automatic drip irrigation installations. Have my Sprinkler Spring Turn on Completed by the Professionals, or do it Myself? How Does Pacific Lawn Sprinklers Stand out From the Competition? For close to four decades, Pacific has been offering lawn sprinkler irrigation installation and service, low voltage landscape lighting installation and service, holiday decorating, and drainage solutions. When Should I Turn On My Sprinkler System?